For one of Gary's new year's resolutions, he is to make dinner at least once a week. Ever since we met, he's cooked for me maybe handful of times, so this is a big deal. Three weeks into the year and so far we've had three excellent meals. For one of the dinners, we invited some good friends of ours, Jennie and Thomas, to join us. Since Gary was just starting out, I decided to help make the dessert. I've been obsessing over making apple pie; there's just something about apple pie that is so comforting and enjoyable. 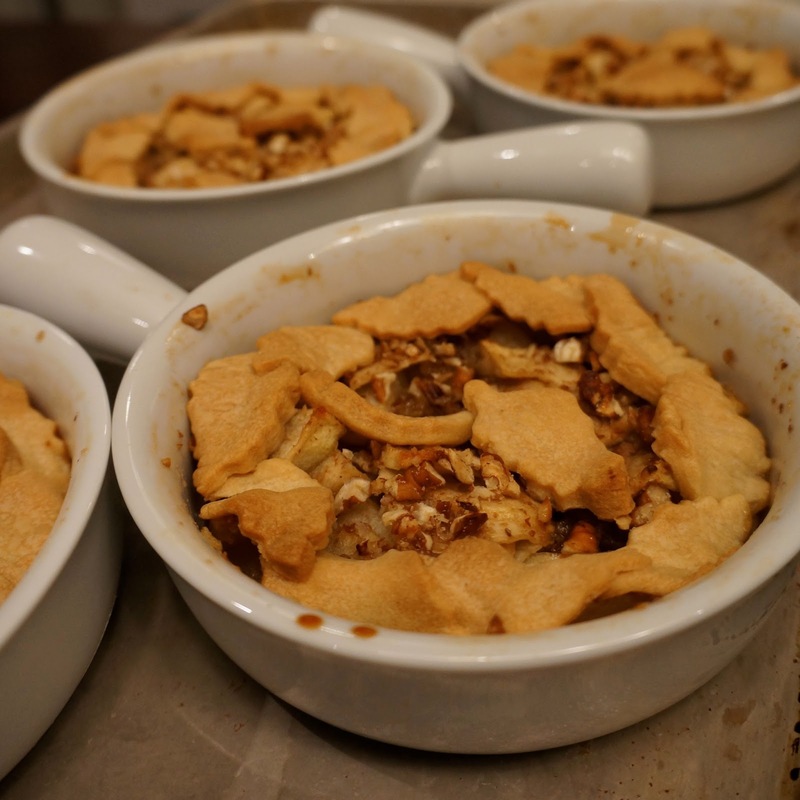 I've made my fair share of apples pies in the past and wanted to do something new, so I decided to make individual pies in gratin dishes. mix apples, lemon juice, sugars, and salt in a bowl. divide up mixture into 4 gratin dishes. sprinkle pecans on top of apples and then drizzle honey over each dish. set dishes aside. roll out pie crust and use a cookie cutter of your choice (i used a leaf). cut out as many pieces as you can from the crust. you can gather up and roll out the left over to cut out some more. lay cut out crust pieces onto of the apples. place dishes in oven for 30-40 minutes or until the crust is golden brown.